Ancient hunter-gatherers began to systemically affect the evolution of crops up to thirty thousand years ago – around ten millennia before experts previously thought – according to new research by the University of Warwick. Professor Robin Allaby, in Warwick’s School of Life Sciences, has discovered that human crop gathering was so extensive, as long ago as the last Ice Age, that it started to have an effect on the evolution of rice, wheat and barley - triggering the process which turned these plants from wild to domesticated. In Tell Qaramel, an area of modern day northern Syria, the research demonstrates evidence of einkorn being affected up to thirty thousand years ago, and rice has been shown to be affected more than thirteen thousand years ago in South, East and South-East Asia. Furthermore, emmer wheat is proved to have been affected twenty-five thousand years ago in the Southern Levant – and barley in the same geographical region over twenty-one thousand years ago. The researchers traced the timeline of crop evolution in these areas by analysing the evolving gene frequencies of archaeologically uncovered plant remains. Wild plants contain a gene which enables them to spread or shatter their seeds widely. When a plant begins to be gathered on a large scale, human activity alters its evolution, changing this gene and causing the plant to retain its seeds instead of spreading them – thus adapting it to the human environment, and eventually agriculture. 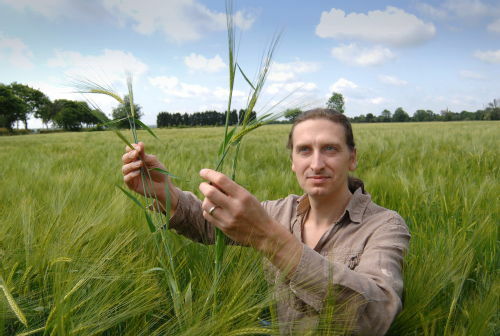 Professor Allaby and his colleagues made calculations from archaeobotanical remains of crops mentioned above that contained ‘non-shattering’ genes - the genes which caused them to retain their seeds – and found that human gathering had already started to alter their evolution millennia before previously accepted dates. The study shows that crop plants adapted to domestication exponentially around eight thousand years ago, with the emergence of sickle farming technology, but also that selection changed over time. It pinpoints the origins of the selective pressures leading to crop domestication much earlier, and in geological eras considered inhospitable to farming. Demonstrating that crops were being gathered to the extent of being pushed towards domestication up to thirty thousand years ago proves the existence of dense populations of people at this time. The research, ‘Geographic mosaics and changing rates of cereal domestication’, is published in Philosophical Transactions of the Royal Society B. Image: Professor Robin Allaby, credit University of Warwick - click for high res.